An exoskeleton that can restore mobility for people confined to wheelchairs is always met with interest by medical professionals and by those affected. This time around, a lot of interest is evidenced in a team's effort to provide an exoskeleton that does not require the use of crutches. This is an autonomous exoskeleton walking with paraplegics (people with lower limb paralysis). Atalante has been designed by the French start-up company Wandercraft. The Wandercraft team said the exoskeleton is planned for use in rehab centers, first in Europe, aiming to enable new treatments and longer, more frequent sessions. Building something ordinary for extraordinary people—that is the way they see their mission at Wandercraft. Translations: Letting mobility-impaired persons walk again. Helping wheelchair users recover autonomy. Two thoughts may immediately come to mind watching the video and the thoughts are incompatible. Thought 1: What a miracle to see paraplegics walking without aid. Thought 2: Pairing a robot with a human is no easy task— Noisy, clunky. But never mind the clunky nature and noise. Engadget's Steve Dent reported on test subjects during Wandercraft preliminary trials using its Atalante prototype. "There was such a strong emotional response from our test subjects," said Managing Director Matthieu Masselin. "For a lot of them, it was the first time they had been able to walk since their accidents." An ICRA paper on their work is titled "Towards Restoring Locomotion for Paraplegics: Realizing Dynamically Stable Walking on Exoskeleton," by nine authors. Affiliations include Caltech (California Institute of Technology), Wandercraft and University of Michigan, Ann Arbor. A video from AMBER Lab (Caltech) on May 17 carried the note that this is a "dynamic exoskeleton walking with paraplegics." 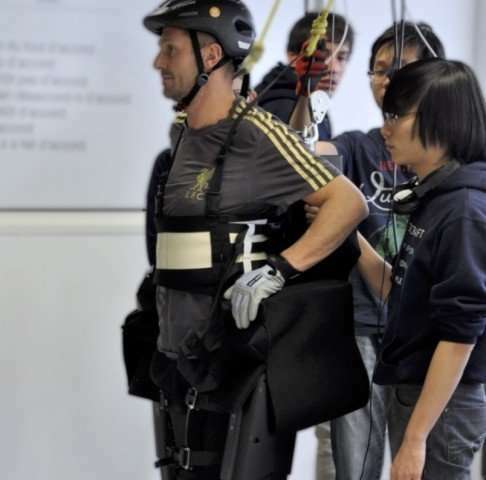 The video note said it was achieved through a mathematical control framework for dynamic locomotion realized on the Atalante exoskeleton developed by Wandercraft. So, how is this designed? Daily Mail said that "Atalante has two movable legs and a back rest which are attached to the user via straps that help distribute pressure uniformly." Engadget described a large battery at the back, with an Intel Core i7-equipped microcomputer. The latter "does the complex math needed to ensure the machine can balance and walk." Their work removes a need for crutches, which stress shoulder muscles, and the more fatigue, the less opportunity there is to leverage more frequent rehab sessions. Also, the gain to walk without crutches goes beyond vanity; significant health conditions are alleviated by being vertical as often as possible. Dent in Engadget: "That would help them deal with a host of medical problems that able-bodied folks don't experience, like cardiovascular issues, pressure sores, incontinence, loss of muscle tone and depression." Dent witnessed a private-showing demo and described what he saw. He described the motion as controlled lurching. All the same, he said, "such tech has never been tried and many of the test subjects hadn't risen from their wheelchairs in years. With time, patients would develop more skill, and the exoskeleton is bound to get smoother." Dent wrote that, sitting in the device, one makes a gesture to stand up by bending at the waist. "That activates motors that automatically drive the exoskeleton to a standing position. Walking can then be cued either by patient gestures or automatic programs started by the therapist." All in all, the paper explored experimental realization of hands-free dynamic walking by subjects with a lower spine injury. The authors spoke of future directions in research. They said they hoped these directions will enable exoskeleton locomotion "in everyday life settings, from traversing up and down stairs to walking outdoors in natural environments."